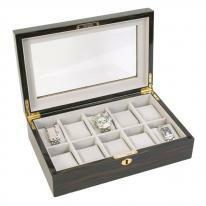 A jewelry box that locks fully and completely will keep your fine jewels safe. 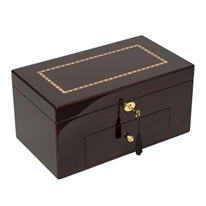 Choose from wood jewelry chests and leather jewel cases for travel or home that lock completely, in styles for both women and men. 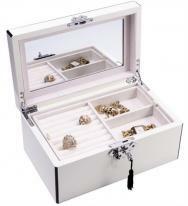 Jewelry boxes, cases and chests that lock provide security for your valuable jewelry and watches. 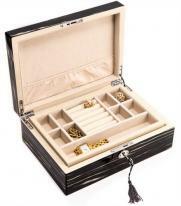 If you don't see a jewelry box that locks to fit your jewelry needs, we welcome your call or email. All boxes, chests and cases that lock qualify for 1 year product warranties and easy returns.